Khadi Orange Soap has as Tringent Anti Bacterial, Antiseptic, Toning and cleaning properties. Use it as a natural treatment on oily skin. Ornage Oil, Almond Oil, Glycerine Oil and Vegetable Oils. Khadi Orange Ayurvedic Handmade Soap comes in a transparent polythene cover with white label backside contains products details. The package is very simple. The colour of the soap is yummy orange which looks so pretty. 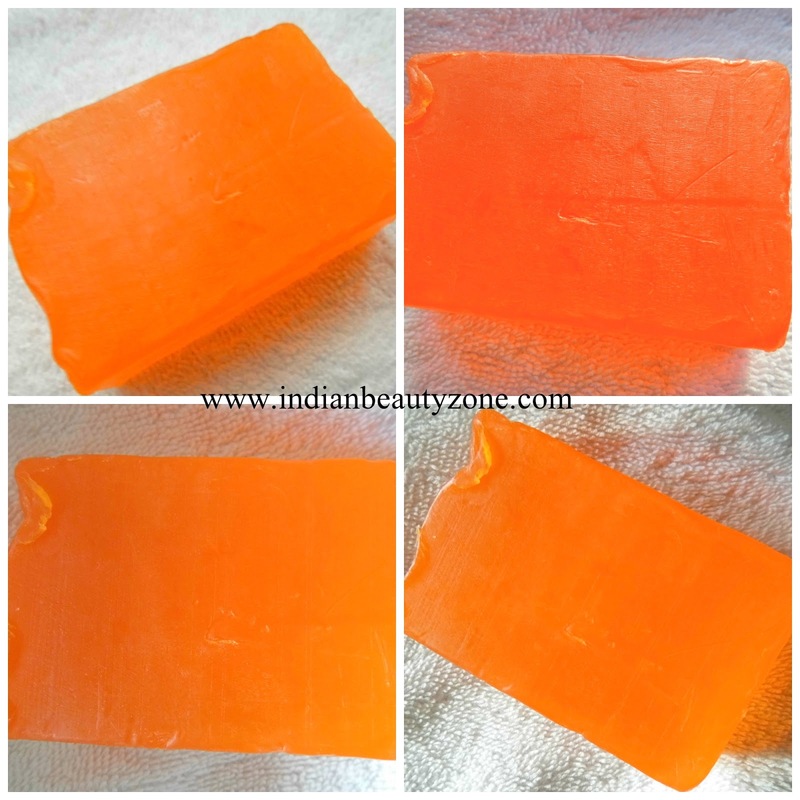 Square shaped soap bar smells refreshing orange flavor. I loved this soap very much, because this soap makes my every bath refreshed. This soap lathers well and cleanse the skin very well. The smell is so lovely and refreshing to make your bath a beautiful experience. This soap leaves the skin clean, smooth and soft. I never felt any dryness or itchiness because of this soap, since this soap is made up of essential oils. I wanted to bite this soap bar when I opened the cover, it looks like a orange jelly sweet. This soap soothes the skin and improves the skin texture by regular use. I wanted to repurchase it again, but that time it is out of stock and now I got some other interesting soaps from my brother to try. All I can say it was an awesome experience for me with this yummy soap bar. Orange is generally good for skin and especially it is very useful for oily skin. Orange juice and orange peels helps to control your skin oiliness. Orange helps to control your sweating odor when you use in your bathing water. Orange fruit is rich in vitamin C and it is comes under citrus fruits category. This soap is not tested on Animals. This soap made by natural ingredients. It has goodness of Natural oils. This soap smells very nice. It lathers and cleanse the skin very well. This soap leaves the skin soft and smooth. This soap never dries the skin. Not available in all stores. even i want to try this! looks and sounds yummy! do you apply on face as well? New giveaway on my blog…wanna join? You can a 100$ coupon to spend on Bellast.com! Have been them since childhood! Love their smell! I haven't used this one but have tried other others from their range. Their soaps are actually good but they never mention all ingredients used. color itself is refreshing .. I remember the lemon one you reviewed, this one sounds just as yummy for the body ;), xoxo. If i didnt know it was a soap..I would have just eaten it up...It looks so yummy & refreshing Radha...Great review dear! I Have tried it, but it is so bulky, needs to be cut into pieces.